With a minimum effort, TAdvStringGrid allows rich text inplace editing. Only 2 event handlers and one property open the way to rich text editing in every cell or selected cells of TAdvStringGrid. Other settings are done in a similar way. 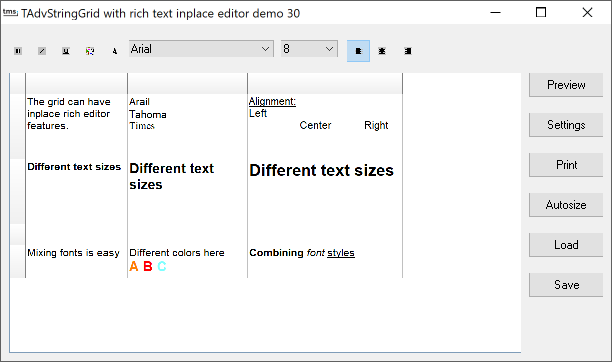 A new event is introduced to let toolbar settings for selected characters in the rich text editor reflect the current selected style such as fontstyle, fontname etc.. This event OnRichEditSelectionChange is triggered whenever the user changes the selection in the inplace rich editor. In this event, the toolbar button style can then set to reflect the setting of the selected text. Normally, whenever another control gains focus, the TAdvStringGrid inplace editor is hidden and the inplace editor text is set in the grid's cell. However, with rich text inplace editing this behaviour is not wanted. If the inplace editor would be hidden, the selection would disappear and no longer available to apply changes such as font changes. Therefore, for a rich text inplace editor the editor remains visible even when another control on the form gains focus. Some controls, such as a font selection combobox can then be used to set the selected font name. However, for other control that perform something like a grid print or preview, the rich text inplace editor should be hidden and the cell contents should be updated before doing the print. This can be done with the Grid.HideInplaceEdit method.